Silent cinema seems to be remembered only for its iconic horror films, whether it be American films like The Phantom of the Opera, Viktor Sjostrom’s The Phantom Carriage, or the many examples of the contorted world of German expressionism. F.W. 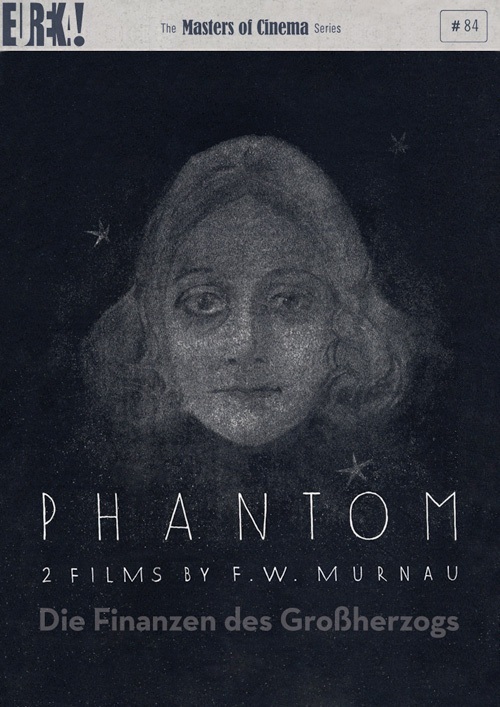 Murnau followed his masterpiece Nosferatu with Phantom, a film that promises all the trappings of expressionism but delivers very little. Murnau is undoubtedly one of the most important artists in the medium and would indeed push its very limits with The Last Laugh four years later by presenting it as a complete silent film (almost) without inter-titles. Phantom is melodrama, the void where many silent movies find themselves in. The blame seems to fall on Thea von Harbou, the prolific screenwriter of many films of the Weimar era. Her storytelling is primitive with thin motivations and simplistic dialogue that often cuts awkwardly to the point. Her story concerns a would-be poet who falls in love with a woman he sees for an instant, becomes obsessed by her, and when he cannot have her he finds another girl who looks like her. As a work of expressionism the film could have been a masterpiece, but scene after scene relies too heavily on dialogue and the image is mostly flat. 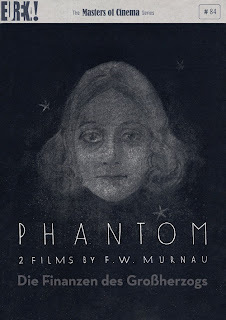 Murnau lets loose about ¾ of the way into the film with some fantastic trick shots to dramatize the poet’s inner struggle, but the machinations of the plot bog the film down for Phantom is not only about the obsessive love of the mysterious woman, it concerns the poet’s sister who leaves home to become a loose woman, and about the poet’s poor mother who suffers a long martyrdom at the turmoil of social shame; a financial swindle, and characters that seem to pop in and out to disrupt a scene just to extend the running time. The theme of the double is ever present in expressionism and it occurs here when the poet Lorenz finds a destitute young lady who so closely resembles the woman he really loves. In order to keep this woman as he wants her, Lorenz, whose poems unbeknownst to him have been rejected for publication, makes a deal with his aunt and promise her the poems’ profits for money upfront. He splits 60,000 marks with the man who thought up the swindle who also happens to be Lorenz’s sister’s lover. This character first appears with the aunt in an earlier scene, and without explanation he decides to turn on her. But never mind about this. All this comes about one hour into the film, and the first hour begins pleasantly enough with Lorenz going to a literary scholar, and the man’s daughter who is secretly in love with him, and shares with them his poems. Time is also taken with the sister defying her mother and partying while the mother suffers so. These scenes are so thick I cannot help but think von Harbou is trying to give some sort of social message, heavy handed just like in all her collaborations with husband Fritz Lang. When Lorenz’s aunt does some investigating and discovers Lorenz has been missing work and is indeed not being published, she gives her nephew three days to returns the money he’s already spent on his lover. What’s interesting is that none of these characters are interesting. We never get to know any of them, and Lorenz’s lover appears in maybe six short scenes and we only know that she has no money. I think it’s obvious she doesn’t love Lorenz for she tells him if she has to give up everything he’s bought for her she would no longer love him, but that is the problem with the film. Everything is so blatantly stated in the title cards. There is no mystery to the plot, only confusion which can often mask itself as such, and the characters are confined to these problems. The only character I remotely cared about was the literary scholar’s daughter because she is the virginal, sweet-faced waif who pines for Lorenz in the background of his disastrous affairs. The film begins with she and Lorenz married and she encourages him to write down this story. Knowing this I was interested in how they would get together but in the end they’re just thrown together in the highly symbolic, overly politically ending with the title card—atonement; we see Lorenz being lead to prison. Title card—redemption; he has served his sentence and now returns to the outside world. I wasn’t at all impressed. The photography stood out for me in moments, but as I already said this is a flat film with no depth and flat lighting. The simple truths of German expressionism (high contrast, bold shadows) are not on display here. But Murnau was the most curious of expressionism’s directors. Nosferatu is the most well-known example of the movement but even still, much of the beginning of that film is taken up with striking naturalistic photography shot on location. I responded to the same naturalism in Phantom, and indeed recognized, I think, many of the same locations used in Nosferatu. There’s a fabulous shot when Lorenz begins to realize the dizzying spell he’s caught in where one side of the street begins closing in and chasing him. We see the shadows of the building tops following Lorenz as he tries to get away. There’s some other imagery accompanying the same theme that is fun to watch but the conceit is lost in this film. It lacks style and substance and goes for quick heavy-handed messages. The film has been beautifully restored by the F.W. Murnau Foundation which has restored many of Germany’s most important silent films. The original color tints have been added to scenes stemming from the original negative, but a dupe positive was also used in the restoration and these brief scenes remain in black and white.